Traveling wasn't enough for this free spirited female. I needed to live abroad. Now I am happily living in Uzes, France. My blogs are about my adventures as a post-career, solo woman maneuvering her way through everyday life in France and on travels to various parts of the world. I hope you enjoy my adventures, photography and the people and places I run into along my way. Any who visit Uzés, France are in awe of the Château de Duché. It’s the centerpiece of the town and home to the Duke of Uzés — the oldest ducal peerage in France. The Château de Duché was built in the 12th century by Lord Bermonde of the House of Crussol. Along with the château, three distinctive towers were erected within the wall of the medieval town. The most prominent tower of all carries his name — Bermonde Tower. All of the structures are standing today. The wall has disappeared and the wall’s watchtower is in ruins. Ancient watch tower, part of the wall surrounding Uzes in Medieval times. The gothic chapel, a striking feature of the château’s courtyard with its glittering red tiled roof, was added in the 15th century. During the 16th century, the cháteau underwent extensive renovations. Duke Antoine — the first peer of France, ordained by Charles IX — ordered refurbishments that morphed the medieval castle into an elegant Renaissance cháteau. The courtyard became the main attraction. The château served as a defense unit during the War of Religion and the Revolution. It was never attacked or destroyed. As the town went through various phases of wealth and decline, the château was used as a school dormitory, workshops and classrooms. During WWII the buildings were occupied by the Germans.Jacques de Crussol, the current resident of the Château de Duché and 17th Duke of Uzès has this to say about the state of Uzes during the era of his grandfather (1943-1999). It was the Duke’s grandmother, Anne de Rochechouart de Mortemart, who lobbied the Minister of Culture under Charles de Gaulle to list Uzés as a protected site, enabling the chatéau and the town to find funding for the much needed restorations. Due to the efforts of the Duchess of Uzes, a law is now in place in France that similarly benefits other cultural and historic sites throughout the country. The gutsy grandmother was the first woman in France to be granted a driver’s license. She was instrumental in campaigning for women’s rights, including the right to vote. I’ve spent day after day staring at the Duché from my apartment windows and I’ve taken hundreds of photos every angle. Finally I found the perfect opportunity to visit inside — along with hundreds of other sightseers — during the Journées Européennes du Patrimoine or European Heritage Days. Come along and let’s take a tour. Why Do I Love France? Why do I love France? That’s a question I’m asked by those who wonder why, after four years, I’m still here. A French Collection asked five bloggers who write about France, including moi, “Why do you love France?” After reading each response, perhaps you’ll understand how we feel and why we’re so anxious to share this wonderful place with the world. Why do you love France? Maybe it’s the romantic appeal of beautiful towns and villages, the proud French people and their traditions, mouth-watering food, historical buildings and gardens, priceless art or diverse landscapes? 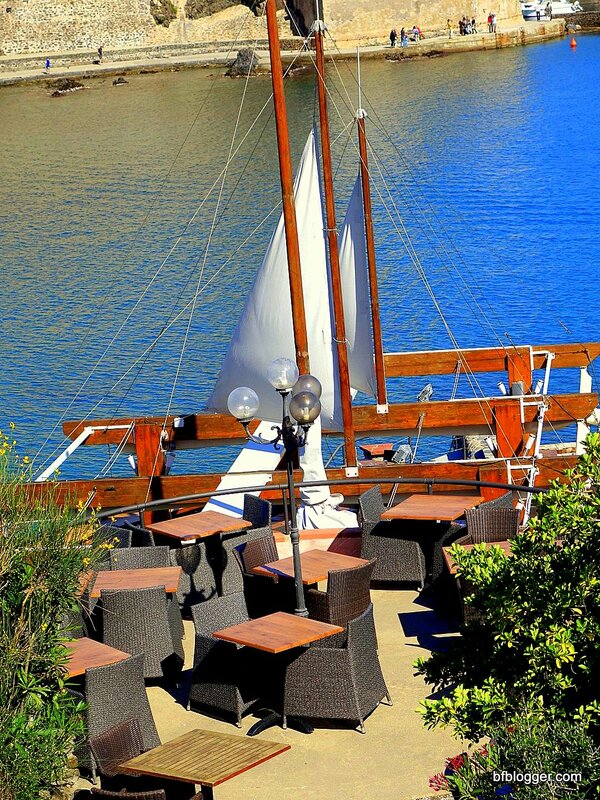 Or maybe its simply the appeal of sunshine, long lunches and a carefree life. Everyone’s love affair with France starts differently and to showcase that I asked my five favourite French bloggers/writers to share with us what they love most about France and how they share their passion with others. You’ll see they share their love of France through publishing magazines, writing books, leading tour groups, running gîtes and online shops. Each story is different and engaging. As long as I can remember, I’ve dreamed of “faraway places” — like the ones Mother told me about when I was a child. Escaping into the fairytale world I visited in my mind was my way of dealing with real life. “Going to China, or maybe Siam, I have the whole world to see,” she would sing in her less than perfect soprano voice. We didn’t travel much when I was growing up in Charlotte, North Carolina. My mother was a nurse anaesthetist and worked long hours, often on weekends. My father was a merchant and took only a one-week vacation to Myrtle Beach, South Carolina, as I can remember. So as soon as I was old enough to travel alone, I took off. First stop, New York City to visit my favorite aunt, Rose. Aunt Rose was one of those “bigger-than-life” idols to me. A 1937 graduate of the UNC-Chapel Hill School of Pharmacy, and the only female in her class, she was fondly known as the “May West of Chapel Hill.” We bonded during my first trip to New York. I could see that, even at 50 years old, Aunt Rose was a dead ringer for May West, the Hollywood queen — from the perfectly coiffed blond hair, to the long false eyelashes and blue eye shadow, to the buxom figure. Aunt Rose owned New York — or so this sixteen year old ingénue from the Carolinas assumed. With only one day dedicated to sightseeing in the city, Rose drove her car from Jamaica Estates, parked it, and handed me our tickets for the Gray Line City Tour. That was my first lesson. Take a guided tour of the new place you’re visiting. Do it on the first day. A tour gives you the highlights of the area and helps you figure out where you want to return to explore. A guided tour also makes it easier to understand a city map and to get your head compass oriented. I learned my second travel lesson that day : wear comfortable shoes. After leaving the guided tour, we walked for miles through Chinatown and Little Italy. Fortunately we stopped along the way, popping into noodle shops and cafes with Italian pastries. Before the day was over, my senses were on over-drive. I was hooked. Right then, I made a pact with myself that I would visit the “real” Italy and China .. and more. My unquenchable quest to see the world had begun. The Barefoot Blogger is a solo female, retired from a career in corporate marketing and divorced after 40 years of marriage. Four years ago, on a whim and following a dream, she moved from South Carolina to Uzes, France. Travels for work and play have taken me through Europe, into parts of southeast Asia, West Africa, Central America, the Caribbean, Istanbul and Nepal. “Life is an adventure” and I want to explore as much as my body and my budget will bear. Come along as I learn about the world and myself. Especially as I stumble through France where I don’t speak the language. I promise you fun along the way … and we’ll all learn a lot, too. If you’d like, share this blog with your friends and we’ll all travel to faraway places together! Ever heard of Nova Siri? Neither had I until the Golden Girls’ adventure took me to the coastal resort town in the “instep” of Italy’s boot. After 15 days of jumping from place to place in France and Italy, the Golden Girls were ready for a little rest and relaxation. As par for this journey, we picked a spot on the map because it was there and headed to Nova Siri, Italy to spend time unwinding on a beach. One of the Golden Girls is a double crystal, diamond-crusted, ruby slipper, 24-karat gold medallion member of a worldwide timeshare group. She suggested we try out the four-star timeshare beach resort in Nova Siri. It wasn’t her first choice, but every other place we looked was booked solid. She had never traveled to Europe and she was so excited about finding a timeshare that I didn’t have the nerve to tell her “four-star” in Europe is not quite up to the same standards as in the US. It didn’t really matter to me if we had luxury accommodations. My incentive was to see the “instep” of Italy’s “boot” and the Ionian Sea. Traveling to Nova Siri from Rome meant a two-hour flight to Bari, then a two-hour drive on a pretty good highway to Nova Siri. We probably should have spent a little time looking around the town, but our “driver” was waiting to take us to Nova Siri. Fortunately I have long legs and was given the privilege of riding in the front seat of the Audi taxi with the driver. He spoke a little English and was happy to answer my questions about his part of the world. 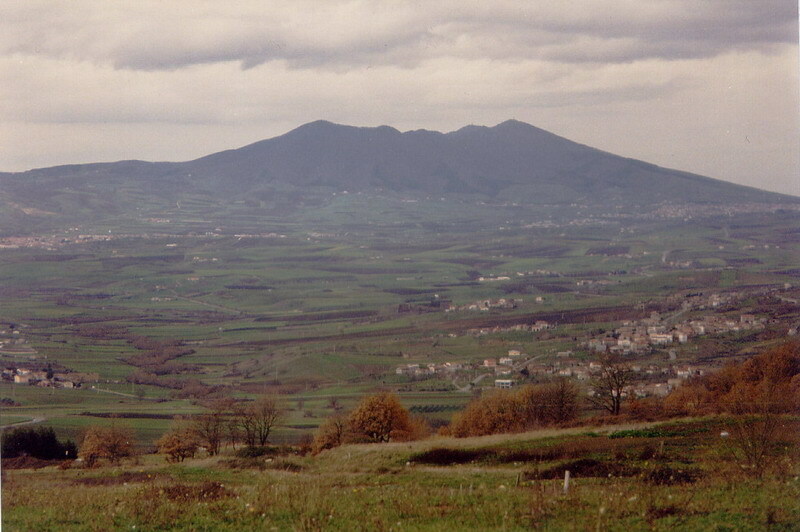 The geography of the Basicilata region is a mix of mountain ranges, hills and plains. While we never went directly through mountains on the way to the southern coast of the Matera province, they were ever-present on the horizon. The towns along the way to Nova Siri were few and far between. Occasionally, when there was a village in the far distance, it looked as if it was a ghost town … deserted. As we drove along, you could see the landscape change. In one area olive trees were lining both sides of the highway. While ahead, vineyards stretched as far as you could see. In just a matter of minutes, and for miles and miles beyond, fields of yellow wheat were in sight; some within touching distance of the cars on the highway. Arriving at our destination — the Akiris Resort — Golden Girl #1 was disappointed that is was not the “four-star” quality she expected. On the other hand, all the amenities were there and the beach with the mountains in the background was magnificent. There was something going on all the time at Akiris. And this wasn’t the busy tourist season. Our accommodations were the equivalent of a 3-bedroom apartment. The rooms were large and the beds comfortable. My room had bunk beds. I slept on the top bunk … reminiscent of my college days. There was no decoration in any of the rooms. All household items had to be purchased at the resort “market”. Nothing was provided — except towels that were like large kitchen towels. What’s with that? Plush bath towels must be an American “thing”? Interestingly the towels we rented for the beach were plush. We ended up using them, instead, for our showers in the apartment. We did enjoy the beach. Which is exactly why we went to Nova Siri. To relax on the beach. … and learned the freshest seafood is brought to the table before cooking while it’s still wiggling. … and lounged by one of the two swimming pools. One friend we literally adopted. We met her the first day she arrived. She was at the resort’s dining room, sitting alone, so we invited her to join us for dinner. Quickly we learned she is German and speaks very little English. She was on a holiday by herself, which she often does. She had been crying all that day because the airlines had lost her baggage. She would have to retrieve them herself the next day … two-hour trip up to Bari and back. After dinner we took her to our place and filled her arms with clothing and personal essentials, including a “South Carolina Girl” T-shirt. She became our new “best friend”. Some among our group took a side trip to Matera. This “little piggy” stayed home. The day’s journey would have been interesting, but I was totally into being a lump on a beach chair. Mel Gibson’s “Passion of Christ” was staged in Matera. He supposedly chose the town because it resembles Jerusalem. Without the tourists. At 4:00 am on the last day of our adventure, The Golden Girls were perched outside the Akiris Resort awaiting the shuttle bus to the airport in Bari. From Bari I was heading to Rome, then to Girona, Spain. The other Golden Girls were going to Paris for five days before returning to the States. A visit to Rome is too overwhelming to be consumed in only a few days. It would take weeks to appreciate the breadth and depth of the city. Like Florence, The Golden Girls were in Rome for a holiday, not a history tour. Besides, this was my fourth visit to Rome. Instead of rushing around, we concentrated on Vatican City. A visit to the Sistine Chapel was one of the Golden Girl’s objectives for traveling to Italy. For two days, we stayed, ate and wandered around the Vatican City area. Except for going onto the papal grounds, we were mostly away from tourists. Which translates to: ‘No one spoke English.” . We were lost most of the time, wandering around aimlessly look for a bus, a cab… the way back to the AIRBNB apartment. Thanks to Map quest, we were OK … when and if we could get online. One thing we learned over the two days is that Romans are very considerate and helpful … except for the cabby who drove us to the Airbnb our first night in town. A ride that should have cost no more than 25 euros cost almost 70 euros. Ok. Give us a break. We’d just arrived by train after a full day in Cinque Terra. And it was after midnight. We were exhausted. Hint #1: Don’t take a “gypsy cab”. Make certain there’s a meter in the car. The friendly Romans were happy to help three struggling American females. We met them at the bus stop when we needed directions on using the transportation systems. They were there for us on buses to wave us off at the right stop. Cafe owners stopped in the middle of their busy morning to give us advice on getting around. Hint #2: If you need help, ask. You will meet some charming folks. One Golden Girl wanted to see the Sistine Chapel. The huge crowds that were gathered in lines to visit the Chapel were enough to convince me that two visits to the Chapel were enough for a lifetime. When I learned the ceiling art had been restored and the restoration was finished, I was happy to wait in line. Seeing Michelangelo’s masterpiece in its full glory was a whole new experience. What I particularly enjoyed that day at the Vatican City was watch people. While looking through my photos of Rome, I realized I had captured with the camera a contrast of “happy” and “not”. The video was lots of fun to make, although apologies to those I might have caught having bad moment. Who knew “Cinque Terre” meant “five villages”? Before heading on The Golden Girls’ adventure, I’d never heard of it. The Golden Girls’ Cinque Terre visit started on a chartered bus from Florence. Our AIRBNB host set up the tour that was by bus, train and boat. Since visiting Cinque Terre, I’ve learned that many friends have been there. Some have even gone between each of the villages on foot. My hat’s off to you. We found it hard enough to be carried by bus and train. The day we visited Cinque Terre, unfortunately, there was bad weather. A landslide in one of the villages and no ships sailing to another meant we had a full day exploring three of the villages — Riomaggiore, Corniglia and Monterossa. 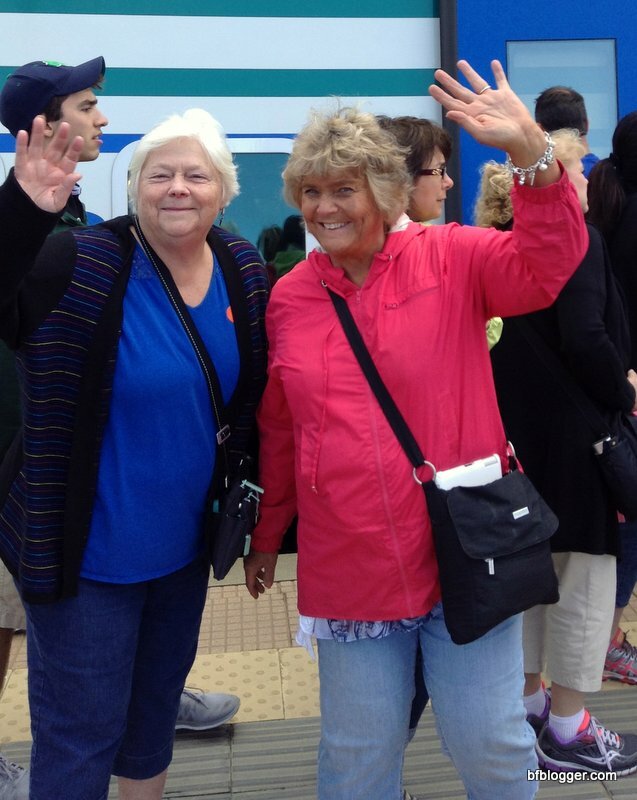 After leaving the chartered bus in La Spezia, The Golden Girls boarded a train for Riomaggiore. Getting there on a foggy, cool day was a bit disappointing. We were hoping for sunny skies. However, the beauty of the quaint hillside village more than made up for the clouds and sprinkles of rain. By the time we reached Corniglia by train the clouds had lifted and the sun came out to give us an excuse to head for the beach. This was the ideal village for lounging at a seaside cafe and watching people, my favorite pastime. Ahh… the beer was tasty too! Village and sea views in all directions were breath-taking. Nothing prepared me for Monterossa. From the multi-colored houses to the dramatic coastal cliffs, this village is one to underline in the memory book. Interestingly, now that I have only photos to remind me, it’s hard to believe these came out of my camera. It is truly real. Dare I forget about shopping? Not as dazzling as the scenery in Monterossa, the local shops still put on quite a show. How can you resist stopping to check out the retail here? Join me to look around. Hopefully when you visit Cinque Terre you will see all five villages. For me and The Golden Girls, perhaps another day. Florence, Italy is a place you should try to see at least once in your lifetime. For “The Golden Girls”, two of us were making repeat visits. That meant this had to be a unique and fun experience for each of us to remember. Little did we know our memorable experience would start as soon as we got there. As you recall, Mustang Sally was left behind in Girona, Spain so that we could take the late night flight to Pisa, Italy. That meant from here on out, we were getting from place to place by plane, train, bus and cab. “Nothing wrong with that,” you say. Well, it depends on who you’re traveling with. You see, (1) none of The Golden Girls know north and south from east and west; (2) trying to read a map is a joke; and (3) we’re all “blonds” to the root. We arrived at the train station in Florence from Pisa with all our luggage, bags and hats in tow. Planning to take a cab to the AIRBNB apartment, we were pleased that someone met us immediately to take us to the front of the cab stand. But wait. It wasn’t a strong, burly cab driver. It was a petite young girl. She quickly grabbed our bags, putting two under each arm. Pulling rolling bags with her hands, she darted about the crowded train station. Through the crowds, down the stairs, to the outside, up more stairs, and then to the cab stand. It was then that we discovered the place we landed looked very familiar. She had taken us in a circle. The cab stand was basically where we got off the train… just outside the door. We had been duped. She just wanted to hustle us for a tip. Hint #1: Get your own cab at the train station in Florence. Fortunately, the cab driver was honest and took us directly to our AIRBNB apartment — although he couldn’t take us to the door. Our building was on the street of one of the busiest marketplaces in town.- San Lorenzo. Yippee! You know that’s not a problem for us. Bring it on! Shopping at our doorstep. Even better, the apartment and the hosts were terrific. We had our own place with three bedrooms, a kitchen and a living room. After our ordeal in Pisa, this was a palace. Two of us had seen all the museums, churches and gold-laced artwork we wanted to see on previous trips to Florence. Golden Girl #3 had no interest in the above. So we set out to make this trip memorable with everything else that Florence has to offer. One of the biggest markets in Florence was at our doorstep. — San Lorenzo. Need I say more? There were leather goods everywhere. So many choices and so little space to fit purchases. Believe it or not, I bought nothing! There were plenty of temptations. Florence is a mecca for leather, jewelry and high fashion. Tourists were everywhere. It was easier to find someone speaking English than anywhere else we’d been. Picking out locals from visitors was no problem. We had no real agenda for tours or anything else. Our meals and restaurant stops were not scheduled. An inviting cafe surrounded by interesting sights and sounds would draw our attention and we’d pop in for a drink or a meal. We surely missed a lot of well-known and fabulous restaurants by not focusing on where to eat. However, with no car and no real schedule, mealtime was not a priority. Regardless, you can see we ate well. A little gnocchi with aubergine and tomato here ..
Our apartment host was a chef at a local restaurant, so he gave us a few suggestions for places to eat. One was so good we returned for every meal! Hint #2: Eat where you please. It’s all good! If there’s music, even better! Visiting Florence, you feel like you’re walking back through history. Ornate buildings, voluptuous statues and narrow streets remind you of another time. The smallest detail on a structure has meaning and a story behind it.Like this monument on the side of a building. Its design gave rise to the tradition of encasing important religious items in glass enclosures. It was hidden away on a side street in Florence’s busy tourist area. The Duomo is a study in art, architecture and history all in one. Perhaps you’ve never noticed this ornament at one of the entrances to the cathedral. An ancient compass.Details everywhere. You can find a tour that suits your interests. It’s worth the time and it gives you lots of exercise. So you can eat more! There are bicycles and motorcycles that think they have the right-of-way. I’m not kidding. It’s a problem and a danger, but it’s all part of being in Florence. For me, the best part of returning to Florence was to share good times with good friends. Visit the Ponte Vecchio once more. And look at handsome Italian men! Whenever you are on an extended trip that takes you to many destinations, you’re bound to go to certain places just because they’re on the way. That’s how The Golden Girls ended up in Pisa, Italy. Discovering Port Vendres and Collioure because they were on the way to an airport was good luck. Stopping overnight in Pisa because we wanted to land somewhere near Cinque Terre was a mistake. Sorry, “Pisans”. Aside from the Leaning Tower and surroundings, we didn’t find Pisa to be a great place to visit. If you want to see the tower, and take one of those predictable “holding up the leaning tower” photos , I suggest you drive by and jump out with your camera. Perhaps after a busy day in Collioure, a drive to the airport in Girona, dropping off Mustang Sally in an unfamiliar country, a long wait and bad food at the airport, we weren’t in the mood for what happened next. For the first time in my traveling with AirBNB, I made a mistake. In my defense, we made this part of our plan at the last-minute. So there were few–almost none– places listed for Pisa. We pretty much booked what was available. For a twenty-something it would have been fine. For The Golden Girls, it was bleak and noisy. To begin with, the room we booked in the “B&B” was tucked away in a scary alley in the oldest part of town. The cab driver wouldn’t even take us down the street. After we got over our shock and disappointment with our location, we lugged our bags up the three flights of stairs to our room. The place was stark and dreary, but clean. One double bed, one single bed, and a side table. That was it. No lamps, pictures or decoration of any type. Beds and pillows were hard, bath towels resembled large kitchen towels. It was adequate, and I repeat, it was clean. But it wasn’t exactly what we were hoping for when we were so tired. One of the good things about traveling with these friends is that they make the best of everything. Just minutes after taking in the situation, we were laughing hysterically. I think it was right after we discovered our room was on top of Pisa’s “party central” — the square where college kids meet to drink and dance. All night. Daylight came really quickly and our surroundings didn’t look so bad. We agreed the. B&B would be a good choice for young people. There was a nice living area and kitchen. It could be fun if we were forty years younger. Close to everything” was a true description of the B&B in the AirBNB listing. Not only were we in the middle of the town’s night life, we were within walking distance of the Leaning Tower and the cathedral. For some reason, I wasn’t expecting all the ornate buildings around the tower. Even though I’d done a “ride by” on the “Europe on $5 a Day” trip. The area is truly beautiful. Taking a few more photos of the town to remind us we don’t have to come back, we were off to the train station. When you are traveling alone to a new destination, or you’re with a small group, budget enough to pay for a cab from the train station, or airport. It’s particularly advisable if it’s late in the day, and/or, you don’t speak the language. This might sound pricey, but it can mean a safer, more relaxing entre to your new location. Photos: Thanks to all The Golden Girls for photo contributions to this post. Revisit the seaside towns of Port Vendres and Collioure, France with me and my North Carolina friends. You may want to put these two on your “must see” list! When “The Golden Girls” discovered Port Vendres and Collioure, the quaint towns along the Mediterranean, it was quite by accident. We were looking for an airport near Sete that had cheap flights to Italy. With a little research, we found that the airport in Girona, Spain was only a little over an hour’s drive from Sete. It was not far from the coast, so we could drive along the Med and, hopefully, find a seaside town where we could stop overnight before taking a flight to Italy. Apparently Europeans know Collioure. It was packed with tourists. Not to be discouraged, we settled for the next best thing: Port Vendres, the town just a bit farther down the coast. We arrived in Port Vendres in the late afternoon. Having driven south from Sete, staying mostly on the “super” highway until we turned east at Perpignan. The first town we ran into on the Mediterranean was Canet-en-Roussillon. We stopped for lunch in a Spanish restaurant, Vigatane, then pointed Sally south along the sea toward Port Vendres. Here’s our view from the car as we went away from the restaurant and drove towards Collioure and Port Vendres. Anna is a tall, blonde and fair-complexioned woman of Scandinavian ancestry. She spends time between her apartment in Port Vendres and a home in the Pyrenees. To welcome us to Port Vendres, she personally guided us around the small business area showing us her favorite restaurants and wine merchant. Afterwards, we set out for a night on the town. Returning to our Airbnb “loft” to relax and sleep, we were there just in time to catch sight of the most glorious rainbow — surely a good omen for the next part of our adventure. We had a full day planned in Collioure, so we started out early in the morning, giving ourselves just enough time to grab a cafe latte and croissant, and to check out the Saturday Market in Port Vendres. 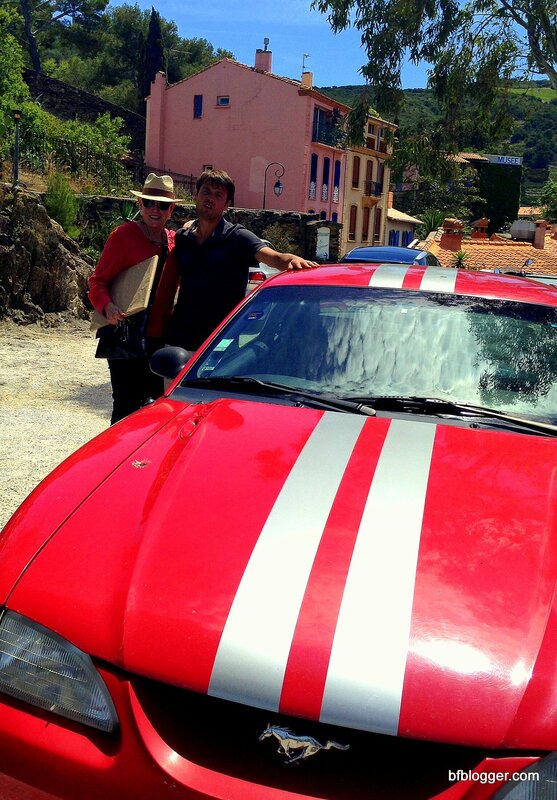 Backtracking, we arrived in Collioure and parked Mustang Sally at a hilltop rest stop. When we got out of the car, we realized the “rest stop” was, indeed, the parking lot for a restaurant. We went into the restaurant, which was busy with staff preparing for lunch, and assured them we would return later for a meal–not just take a free parking spot. From here we were able to walk through most of the town, wade in the surf, and do a bit of shopping. Thinking the day couldn’t get any better, we headed back towards the restaurant on the hill. Oh my! What a treat. The entrance to the restaurant was near the top of the hill; but the service area was down a narrow, stone stairway that led to the sea. When we reached where tables were set, we literally stepped onto a yacht, or what appeared to be one because of the shape of the deck. From our table made us feel like we had set sail on a calm sea. The food? It was heavenly. And the wait staff? Well, one Golden Girl thought he was HOT. You judge for yourself. We told him he could drive Mustang Sally if we could adopt him. Musee Collioure. The artist is in the house. Our lunch was long and leisurely with us all agreeing we are the “luckiest people in the world”. Still we had time to wander into the town’s art museum. The small space handsomely displayed a collection of French artists such as Claude Viallat , Joan Brossa , Dominique Gauthier, Henri Marre, Matisse, and Jean Peské. Our good fortune was that one of the area’s well-known artists, Francois Bernadi, was working in the museum that day. We introduced ourselves and he seemed as thrilled to meet us as we were to meet him. His exhibit, which spanned his career since 1945, had just been taken down to make room for the new show, but we did purchase posters which he proudly autographed with a personal message. View at the top We had a flight to catch from the Girona airport, which was less than an hour away. Before leaving Collioure we drove to the highest spot in town. From top to bottom, high and low, this is a town that should be on every tour map. Love, love! Next on the Golden Girls’ Tour: Pisa! Side trips from Uzes are now behind us. It’s time for the Golden Girls to hit the super highway and head for the Mediterranean coast of France. I couldn’t wait to show off Sete to my friends from North Carolina. After a week’s stay last year, I knew my beach-loving travel companions would like the place. Not only is the city itself of interest because of the canals, architecture, and fabulous seafood, also, the beaches outside the city are magnificent. We envisioned at least one full day in the sun being pampered by handsome waiters as we sunned ourselves at a private beach club. Only one problem. Our days in Sete turned out to be cold and rainy. Oh well, not to be disappointed because of the weather, we found plenty to do exploring Sete’s indoor market and nearby towns along the Mediterranean. Today Beziers is well known for the “Feria”, a 5-day bullfighting festival that draws over a million spectators each year to the town’s ancient arena. Gothic architecture and stately English gardens, also, lure visitors to step back into the past. From the narrow street that runs through Bouzigues, you can see miles of oyster beds that stretch into the Mediterranean . Oysters in L’Etang de Thau are grown on posts designed specifically for maximizing the crop yield. Another attraction in Bouziques is the many seaside restaurants. On a rainy day, however, most were closed for afternoon business. Mustang Sally is the red 1996 Ford Mustang I’ve been blessed to drive in France. She belongs to my dear friend, Geoffrey, who has been the star character in many of my blog posts. When I first arrived to set up my new life in France, Geoffrey made an offer I couldn’t refuse. We arrived at a lease agreement for the red car with black racing stripes. Now Mustang Sally is living in the underground car park near my apartment. She’s raring to go at a moment’s notice. The trip down to Sete was no exception. Packed to the brim with suitcases, bags and hats, Sally proudly provided more than transportation down the super highway and scenic roads for my Carolina guests, she was our “touch of class.” I mean, how else would passerbys know The Golden Girls were around? She stood as a beacon wherever we landed. Along the highways she hit the 120 KPH speed limit with no hesitation. It was at the many toll booths along the way that she showed her one malady. The driver side window is stuck closed. After one or two stops, my travel companions and I had the tollbooth routine down flat. Sally would roll up to the gate while I was unbuckling my seatbelt; the front seat passenger would ready the change for the toll; I’d stretch as far as my arms and legs would reach to insert a ticket into the machine to add up the fare; I’d feed the fare into the meter; slam the door; buckle the seatbelt; and we’d speed off before the car behind us could blow its horn in total frustration. This scenario repeated for most of the two-hour drive to Sete. We went the quickest route, rather than drive on the back roads. Likewise, the stops at Beziers and Bouziques were easy turns-offs from the super highway. One of my favorite things about the visit to Sete was the Airbnb apartment. Right in the center of town, facing the main canal, the location would please my friends, I was certain. Yes, they were thrilled with the apartment with two private bedrooms and an amazing view, as I suspected. They clicked immediately with our host, Nancy, and soon we were feeling right at home. To view the Airbnb listing, click here. 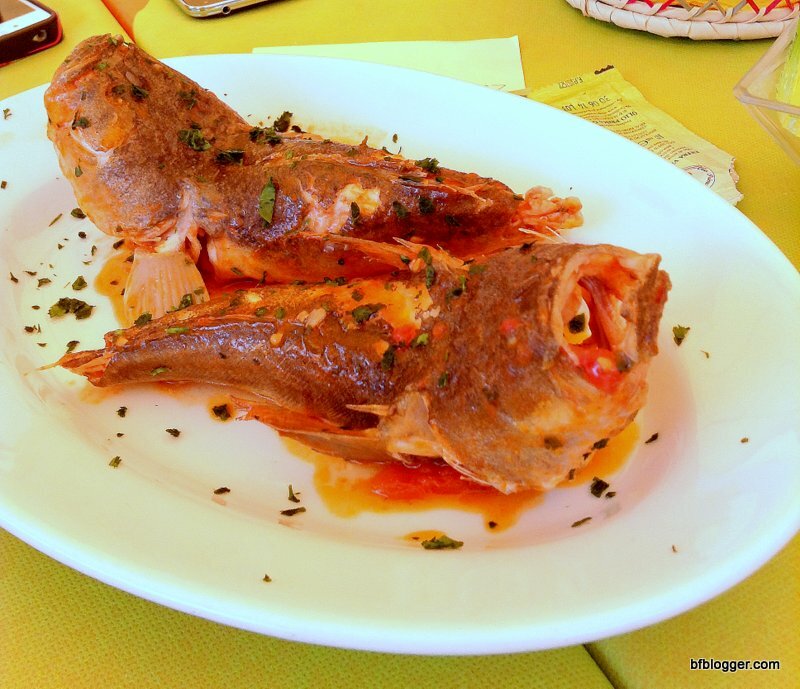 There’s only one good answer for what to eat in Sete: seafood! One of the most “productive” fishing areas on the Mediterranean, the town is particularly well known for oysters, sardines and tuna. Restaurants line the streets along the harbor and they seem to serve similar dishes. Grabbing a plate of raw oysters at the city market, along with a glass of wine or beer, is a treat I was determined to give myself. The idea of “raw” didn’t go so well with the other Golden Girls, but they did taste “tielle” which is a local delicacy– octopus pie. Another specialty from Sete is fish soup. It is a tomato-based, heavy fish broth served in bowls like chowder. The best part of the soup is the croutons that float on top. But before you set the croutons off to sail, you smother the crunchy bits of toast with garlicky aioli, and cover them with flaky Parmesan cheese. When driving in an unfamiliar place, especially if you don’t know the language, be sure to take note of where you park. It’s easy to get lost if you’re as absent-minded as I am! To insure you get back to the right place, take pictures of your parking spot and direction signs along the way. Tracing the history of the Romans in the south of France is a fascination I am anxious to share with visitors. Guests visiting from North Carolina were more than happy to take the short ride from Uzès to Nimes to attend the Roman Days extravaganza at the Arena. Even though the event was narrated only in French, we were able to understand the storyline. The anniversary of Augustus Caesar’s death was being celebrated by a reenactment of important events during his life. Tracing the Romans in France must include a visit to Pont du Gard. Even though I’ve been to Pont du Gard four times, there’s no better place to take visitors who come to Uzes. The aqueduct that supplied water to the Romans in Nimes as early as 1AD is still a marvel to behold. Every time I round the bend along the walkway in the World Heritage park and see the magnificent structure, I get chills. Visiting during different times times of year makes it new each time to me. School children at the highest point viewing Pont du Gard put this Golden Girl in her element. An afternoon in Avignon is hardly enough time to get a fair impression of the historic city, much less to write a post. For the Golden Girls, it was a beautiful and convenient place to stop for dinner. The Roman connection in Avignon is difficult to follow because most of the Roman ruins have disappeared. However, the Pope’s Palace, the UNESCO World Heritage–listed “Palais des Papes” reminds us that Avignon was once the center of the Roman Catholic world. It is a place that is definitely worth spending time to explore. The Palais des Papes was the residence of seven successive popes in the 14th century. Avignon’s control by the Papacy ended in 1791 when the city was claimed by France during the French Revolution. I shall definitely research Avignon and write more later. Until then, enjoy the photos of our quick visit. From Uzes to Pont du Gard is a 30- minute car ride. Buses run regularly to the park area from the station in the center of Uzes, as well. To travel to Avignon, it is another 30 minute ride or drive. The park at Pont du Gard is very well equipped with cafeteria-type restaurants and snack shops. The park itself is perfect for hiking and for finding places to stop for a picnic lunch. In Avignon we had a quick meal before returning back to Uzes that night. Nothing to brag about. Friends contact me for thoughts on where to travel around the south of France on “girl trips.” Let me share the adventures of my buddies, the Golden Girls, from our tour of France and Italy. Perhaps you’ll get some ideas. Two of my long-time friends from work days in North Carolina asked if I’d like to join them on a tour of France and Italy. With the chance to see unfamiliar parts of France and Italy, plus the prospect of traveling with Arlene and Linda, how could I resist? My two guests from the Carolinas arrived in Uzès a day late after missing the flight to Marseilles from Paris due to an airline strike. They were dead tired. Showing them the 55 steps to climb to my apartment in the tower was not the best way to welcome them, but the excitement of it all gave them the adrenaline they needed to get to the top. Photos below are borrowed from each of my friends. The guest room was ready and waiting, along with the view — the home of the Duke of Uzès. After a night’s rest they were ready to take in the sights and meet some of the locals in my new “hometown”, Uzès. No visit to Uzès is complete without a visit to the Saturday Market. If you’re planning to come this way, be sure to plan to be here on Saturday. It’s the reason I fell in love with this place. It’s still one of my favorite ways to spend a day. One of the best parts of entertaining friends new to Uzès is to see their reaction to the surroundings. One thing I dreamed about before moving to France was to attend a cooking class in Paris. Little did I know that my wish would come true — without leaving the little town of Uzès. 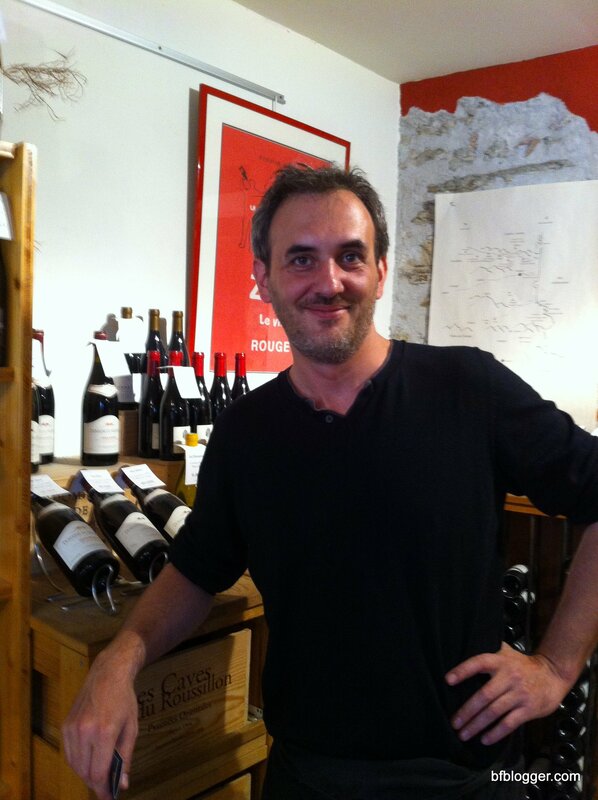 Chef Eric Fraudeau of Cook’n with Class Paris has a cooking school right down the road — Cook’n with Class Uzès. Now I can learn to cook Mediterranean, too! It’s exciting to know you’re learning to cook with one of the best. With over 20 years experience as chef in acclaimed hotels and restaurants such as the five-star Hotel de Paris Monaco, Chef Eric Fraudeau has a background few chefs can claim. His early career includes working in the kitchen with both Robuchon and Ducasse. Chef Fraudeau’s school, Cook’n with Class Uzès, specializes in Provençal & Mediterranean Cuisine — the foods people in the south of France love to eat and often serve in their homes. Classes offered include “French Market Class” and “Cook’n with Fish – Fish and Seafood class”. On market days the Chef and students go shopping together in either of two neighboring towns, Uzès (Wednesday) or San Quentin de la Poterie (Tuesday and Friday). They return to the class kitchen to create and enjoy a meal from the day’s best finds. “Cook’n with Fish” sounded like the best choice for me, especially since fish is one of my favorite foods. What better way to learn how to prepare seafood Mediterranean-style than from an expert? For our Provençal & Mediterranean dinner on “fish day,” some ingredients were more intimidating than others. Squid? Octopus? They’re great to eat, but how to cook them? I was in the right place. Everything was laid out before us when we came into the chef’s kitchen. One by one the ingredients morphed into a pissaladière, a sauce, a salad, a lovely fish dish, a dessert. Chef Eric, along with his guest, Chef Patrick, from the Paris school, stood by to guide and instruct us. Tip #1: Anchovies melt! Who knew? The steps for the pissaladière called for us to slice and brown onions, then add anchovies. Did you know that anchovies melt? They actually disappear when they are heated and stirred into a recipe. Tip #2: Boil oranges? Chef Eric surprised us all when he popped two oranges from off the counter into a saucepan of water … to boil. “Organic oranges only,” he said. “We’re going to use the rind and all,” he added. The oranges, after they were soft enough from boiling, were going into a blender, then into the batter for the cake we were preparing for dessert. Tip #3: How to clean mushrooms. Chanterelles, which are known as “girolles” in France, were spread out on the kitchen counter in all their yellow splendour. Never having “properly” cleaned a mushroom, I was anxious to hear what the Chef would suggest. He recommended that we use our fingers to brush off the dirt, followed by a quick swipe with a paper towel. He said he finds this way of cleaning mushrooms easier than using a brush. It means one less utensil in the kitchen drawer, too. During a gourmet tour of Sète, Nancy McGee from “Absolutely Southern French” taught me how to filet a cooked whole fish, served at the table. To filet a fish to cook, do it the same way. Tip #5: How to “fix” a cooking mistake? Every chef has his secrets and, for this cooking class, Chef Eric and Chef Patrick were willing to share everything, including how to recover from making a mistake. According to Chef Eric, almost every cooking error can be resolved. We watched one “mistake” happen when the “mayonnaise” for the rouille separated. “Rouille” is a creamy, garlicy sauce that’s commonly found in the south of France. You can prepare and serve it in a number of different ways, including as a main course. For our meal, rouille was a side dish. While preparing the rouille, someone (not me, thank goodness) combined the ingredients too quickly. The sauce curdled. Chef Patrick “fixed it” by working with small bits of the mixture at a time. He pushed a little of the rouille to one side of the bowl, then dropped in an egg — yoke and all. He whipped the egg and rouille by hand. Little by little he incorporated the “bad” mix into the “good,” until it all was a perfect consistency. To cook with “class” in France you should know about French etiquette. There are “rules” on how to serve, eat, toast and drink. For example, before a toast, with drinks in hand, you must look each person straight in the eyes. It may take a little longer to take that first sip, but taking the time to do it right will make a lasting impression. Déjeuner, or “lunch” is served mid-day in France. Until the 1960s, déjeuner was the big meal of the day. Families would gather at home for a two-hour break from work or school and sit down for a multi-course meal prepared by the mother. With changing times, many mothers work today. Everyone still takes a two hour break; but, the mid-day meal is abbreviated to something much lighter and not everyone comes home to eat. “Dîner”, or dinner, is seldom served before 7:30pm. If it is the main meal, and especially on weekends and holidays, dîner can last three to four hours. Starting with the apéro, each course is served with complimentary wines, spirits, apéritifs and digestifs. When all the cooking and the lessons were done, Chef Eric invited us to gather around the side table for our apéro course. We toasted each other with tall flutes of champagne. Moving over to a large, beautifully appointed dining table where we sat, we were served the entrée course, or starter — the pissaladière. The main course (“plat”) with “accompagnement” (side dishes) followed. Just when we thought we had eaten enough to literally explode, a wooden platter with an assortment of soft and hard cheeses was passed around — a custom in French dining. Next, dessert — the heavenly “boiled orange” cake with chocolate ganache flowing on top. Now that a bit of the mystery of Provençal & Mediterranean cooking has been revealed, I feel a little friendlier toward raw octopus and squid. Perhaps a visit to Cook’n with Class Paris will take the fear out of wine and cheese pairings … or unveil the magic of macaroons. Today Uzès, next time Paris. Oh, be still my heart! More here on my day in Paris! The red hills of Roussillon are an inspiration for artists, but I had no idea how many famous authors came to visit Roussillon. On my first visit to Roussillon, while riding along the winding roads of the Luberon, I was amazed to see the massive red hills up ahead. They seemed to appear from nowhere. The nearby towns had only small tinges of red. “How is it possible for so much red to be in one place?” I said to myself. Then I learned, as others before me, that Roussillon is like a stoplight, insisting that all who pass stay awhile. You only have to look around to understand why artists love Roussillon. It was as surprise to me, however, to discover how many great authors passed this way. For example, Peter Mayle’s best-selling book, A Year in Provence, was inspired by Roussillon. Laurence Wylie’s, A Village in the Vaucluse was set there too. It was the fact that Samuel Beckett lived in Roussillon that really surprised me. In fact, life in the 1940s village greatly affected his writing, most notably, his play, “Waiting for Godot” (En Attendant Godot). I remember seeing “Waiting for Godot” many years ago at the Playmaker’s Theatre in Chapel Hill, NC. With season tickets to the University of North Carolina theatre, I saw many popular plays performed by the renowned repertoire cast. To me, “Waiting for Godot” was one of the best. In its simplicity the play spoke volumes. Perhaps it was “Waiting for Godot” that convinced me I had to travel and see the world. It is said that Samuel Beckett wrote “Waiting for Godot” because of a painting by German artist Caspar David Friedrich. To describe it simply, the painting is of two people standing on a pathway staring at the moon. Beckett’s storyline has pretty much the same theme. The entire play takes place on one spot on a road, beside a tree. The play is viewed as a masterpiece of post–modernism. Indeed the author paints a simple, rather vague picture of the village, Roussillon. Some say the characters and their stories are straight out of life in and around the 1940’s village and the War. For example, the character Vladimir speaks of ochre quarries and picking grapes for a man named Bonnelly. Tales of starvation, hiding in trenches, and threats of beatings are, perhaps, Beckett’s own remembrances of time with the French Resistance. He pictures Lucky, a man who is starving, tied to a paunchy man with a whip, Pozzo — a scene that calls up thoughts of Nazi concentration camps. Beckett winds all these tales together with vaudeville humor and mime. Perhaps the most astounding fact about Beckett, to this American who somehow refuses to learn French, is that he wrote his most famous works in French. Yes, an Irishman from Dublin chose to pen in French. To Beckett, English was too literal. He could write in a more colloquial style in French. In 1988 Beckett was diagnosed with aphasia, a condition defined as the “loss of speech, partial or total, or loss of power to understand written or spoken language, as a result of disorder of the cerebral speech centers” (OED). Before he died he regained his ability to speak and to read. His writing, again, showed his determination to understand the unexplainable. “Comment Dire“, “How do you say”, with its dashes and repetitions, shows an artist’s everlasting search for words. My beloved labradoodle, Bentley, crossed over the Rainbow Bridge this week. I was devastated. Mainly I was sad that I wasn’t there to tell him “farewell.” Ironically, I was on my way back to the States to see him when I got the news he was passing. I am republishing this post to honor Bentley’s memory. I moved to France and left my Labradoodle, Bentley, behind. “How could you do that?” I’ve been asked by friends and others, especially by animal lovers who believe in taking pets abroad. I mean, it’s easy to take a dog to France. In fact, France loves dogs. All you need to do to take a dog into the country is have a current vaccination record. Or so I’ve been told. How is Bentley getting to France? The only route I could imagine for transporting my 70-pound Labradoodle from South Carolina to France was by commercial airplane — along with me. In the baggage compartment. Under the airplane. Down where it’s very noisy and very scary. The noise and darkness may not be a big deal for some animals, “give him a tranquilizer,” you say. That might work, but let me tell you a little something about Bentley. Bentley is scared to death of loud noises. He leaps into the bed with you during the night if there’s a thunderstorm. He stands on your head. He leaves the room if someone sneezes. He’s been known to have seizures if he gets too upset. In other words, transporting Bentley underneath an airplane would be a death sentence. So, what’s the alternative? Stay home because of a dog? Throw away the dream of living in France because you don’t want to leave your dog? All these thoughts certainly ran through my head. They still do. I miss Bentley everyday. I can’t look at another dog and not feel guilty about leaving Bentley behind. Bentley and I have had long conversations about this dilemma. You see, Bentley lives with my son’s family now. He moved in with them when I left for France. He shares the family with their Goldendoodle Maddy. He helps guard my three-year-old grandson and one-year old granddaughter/. I get to visit with him for months at a time when I return to the States. When we’re back together, it’s like nothing’s changed. We take walks. He sits on my lap when we’re watching TV. He jumps on my bed when there’s a thunderstorm. However, when I pull out my bags to start packing to go away, he knows. I know. We kiss and hug and whisper “goodbye” when I leave the house to take a flight back to France. I get on that noisy airplane and I think of Bentley as we’re taking off down the runway. He’s with me. We’re together. Always. In our hearts. The good news is Bentley is happy with his new home because he has an important job. He and Maddy the Goldendoodle take turns watching over my grandchildren and the family. French Expat Visa Update: Done! When you have an appointment at the prefecture to renew your French expat visa, you’d better show up. Rain, shine … or flu! It’s not that I haven’t been planning for this day. I’ve been pulling the documents together, with the help of Jennifer at Renestance, for months. Birth certificate, income statements, proof of address … all together, including translations of each. The only thing I put off until the last minute was getting a new photo. Don’t ask me why. Perhaps I wanted to wait until I had a better hair day. Mistake! I ended up with the flu. Having a photo made when you have the flu makes a bad hair day look absolutely glamorous! I arrived at the prefecture in NImes pretty much on time. Jennifer was waiting for me at the front door, as we had planned. After quick “bisous, bisous” we walked across the street to a cafe. I signed the application papers Jennifer had prepared. All was going well. I handed Jennifer the stack of papers she’d asked me to bring, along with the copies. “Flip, flip” she thumbed through them all. Thanks to Jennifer’s quick thinking, she captured the bank statements off my mobile LCL account and emailed them to the printer at the prefecture. Promise, I never would have thought of it … in or out of my flu induced stupor! If it all looks pretty tame, you should have seen the room full of people waiting to get to these “windows.” We were called up to the desk at 11:30 for our 10:30 appointment. If one good thing did come out of my having the flu, it was that it helped shorten the approval process. All it took was Jen mentioning to the lady behind the glass that I was sick. “Le grippe?” (the flu?) the lady asked in horror. In less than ten minutes my papers were scanned, checked and approved. After handing me the receipt for my new carte de séjour, the lady behind the glass announced she was running off to wash her hands. Could I have made it through the day without the help of Renestance? No way! Jennifer’s familiarity with the process and the system was a Godsend. Not to mention I could never have survived without her French-speaking skills. Thank you Renestance. ‘Til next year! Marseille: A Stormy Past. A Brilliant Future. A recent weekend in Marseille turned my perception of the city inside out. Now I can’t wait to return. I’ll admit, a weekend in Marseille was not at the top of my travel list. Even though it’s less than two hours away from Uzés. It’s surely because I’ve watched too many movies and TV shows about seaports and gangsters.The trips I made to Marseille to the warehouse district and to the airport didn’t help either. The warehouse district is definitely not a place for tourists. The airport is sprawling, uninviting and confusing. Thank goodness, I was invited to Marseille to celebrate the birthday of a friend from Uzès. That, plus the promise of a great bowl of bouillabaisse, was enough to weaken my resistance. For any who visit Marseille, start your trip at the History Museum. The totally modern museum that’s within easy walking distance to Le Vieux Port represents the history of Marseille in 13 sequences. Through its history of fortune and misfortune, Marseille has maintained a unique character that thrives on its diversity. What’s to do in Marseille over a 3-day weekend? Plenty. Even in the rain. Hop-on-Hop-Off Bus – Take your initial tour of the city on a bus with multi-language narration. Hop on/off as you please. Notre Dame de la Garde – Climb the steep hill to the Cathedral and enjoy the neighborhood and gardens along the way. Maison Empereur – The oldest hardware store in France (since 1827) A HUGE store to ramble through and purchase tools, kitchenware, toys, and more. Vieux Port – The old seaport of Marseille, now a center of tourist activity with shops, cafes, fishing boats, sea vessels and the site of the Norman Foster “Umbrella”. Gare Saint Charles – The train station in the center of town, also a historical monument site, with its magnificent stairway that leads to the city. La Canebrière – Shop along the lively street for a the taste, look and sounds of Marseille and its diversity. La Panier – The oldest district of the city, now an arty, funky tourists’ favorite. MUCEM – An amazingly striking piece of architecture on the former port pier. Exhibits were disappointing but a visit to the building and adjacent Fort Saint Nicholas are a must. Hôtel de Ville – Just a walk by is fine, but don’t miss seeing the bust of Louis XIV above the door. Les Goudes – Just out of town from the city of Marseille, this small village is packed over the weekend, but the coves and views of the calanques are worth the drive. In response to our recent article on cheese etiquette, many readers have wondered just how mould from rye bread found its way into the first Roquefort cheese. Let’s just say that the French are great lovers who also love their cheese. As one might suspect, love and roquefort, therein lies a tale of great romance. Napoleon and Josephine, de Beauvoir and Sartre, Rimbaud and Verlaine, Louis XIV and Marie Antoinette…are just a few of France’s famous lovers, real or legendary. But way back, a largely unknown young couple were responsible for one of the country’s most enduring traditions. Their story is decidedly among the most romantic of all. Once upon a time – almost two thousand years ago, as legend has it – a young shepherd took shelter from a raging storm in a cave on Mount Combalou near Roquefort. No sooner had he begun his lunch of ewe’s milk curds on rye bread when a beautiful young shepherdess appeared, rain-soaked, at the mouth of the cave. The chivalrous young man offered to share his lunch, but as they became better and better acquainted, so to speak, lunch was soon forgotten. When the storm abated, each went their own way – with stomachs empty but with hearts full. A month or so after the young lovers first rendezvous, the shepherd was tending his flock near the same cavern. Fond memories of that romantic interlude surfaced, as did the memory of the abandoned lunch. When he entered the cave, much to his surprise it was still there, but hardly recognisable! Mold blanketed the rye bread and had infiltrated the curds to produced deep blue/green veins. The shepherd, whose hunger knows no bounds, took a bite of the mouldy cheese. One can only imagine his reaction – ‘C’est formidable’! Yes, there’s more. This tale has a happy ending. The shepherdess returned and shared her lover’s passion for the new-born cheese. Together they quickly mastered the art of producing blue-veined cheese in the damp caves of Mount Combalou. An industry was born – along with several heirs who passed on the Roquefort tradition throughout the generations. As a postscript, the couple probably lived happily for quite a long time ever after. Recent studies have revealed the anti-inflammatory properties of mouldy, blue-veined cheeses – which could explain why French mortality rates from cardiovascular-related diseases are among the lowest. Long live the King of French Cheeses! Roquefort cheese is made from the perfumed raw milk from the Lacaunes ewe. Lacaunes sheep produce far less milk than cows, making the cheese rare and precious. Today the mould from rye bread is injected into the sheep’s milk. Mount Combalou provided a rock-like fortress – hence the name ‘Roc Fort’. In fact it was the only environment capable of creating the blue/green veins; other caves close by did not have the same effect. Combalou collapsed a million years ago, leaving narrow cracks as long as half a mile beneath the surface. Cool air blows through them into the caves, providing perfect climatic conditions — 48 degrees year round — for cheese maturation. Roquefort was Charlemagne’s favorite cheese and, according to Casanova, an aphrodisiac. Only peril can bring the French together. that has 265 different kinds of cheese. Today, France is the home to over 1000 types of cheese. It’s a wonder how a modern President can hold things together? Marseille wasn’t high on my list of places to visit. A weekend spent there to celebrate the birthday of a dear friend from Uzès totally changed my mind. On top of being an incredibly beautiful city with lovely, welcoming people, Marseille is for foodies like me. I’ve been to Marseille on several occasions since living in Uzès. Once to the warehouse district to claim a shipment and more than once to the airport. Neither area offers the best of the city. It was hearing that Marseille is for foodies, especially bouillabaisse, that called me back. Is it food that makes Marseille so appealing to millions of travelers? Food in Marseille is as varied as the people: French, Italian, Spanish, Indian, Middle Eastern, African, North and South and Central Americans and more. Restaurants and cafes are on nearly every street and corner. There are over 1000 listed in TripAdvisor, including fifteen Michelin star restaurants. Along Le Vieux Port, where we stayed for the weekend, there were places to eat lined side by side. My first meal in Marseille was a medley of seafoods at La Brasserie du Port. The waterfront restaurant was right below our hotel, Grand Hôtel Beauvau Marseille Vieux-Port. The fresh, beautifully prepared seafood and the service couldn’t have been better. The view from the terrace of the brasserie — the architectural masterpiece by Norman Foster against the background of the ancient port — was stunning. The birthday girl’s selection for meals on her special day was eclectic and international — Indian for lunch and Columbian for dinner. Palais du Maharaja, chosen from TripAdvisor, proved to be the perfect place to satisfy our appetites for Indian food. Discovering Columbia tapas at Tapas La Picadita turned out to be one of the best food finds of the weekend. The menu, the preparation and the friendly staff were so special that we came back the next night for more. Even though it rained during part of our stay in Marseille, it didn’t keep us from wandering the streets near Le Vieux Port. A shop overflowing with bins and bags of Turkish delicacies stopped us in our tracks. We loaded up on dried fruits, spices, teas and candies to take back with us. And we laughed a lot! Even the shopkeeper loved the birthday girl! Somehow the rain in Marseille made the atmosphere even more picturesque and interesting. 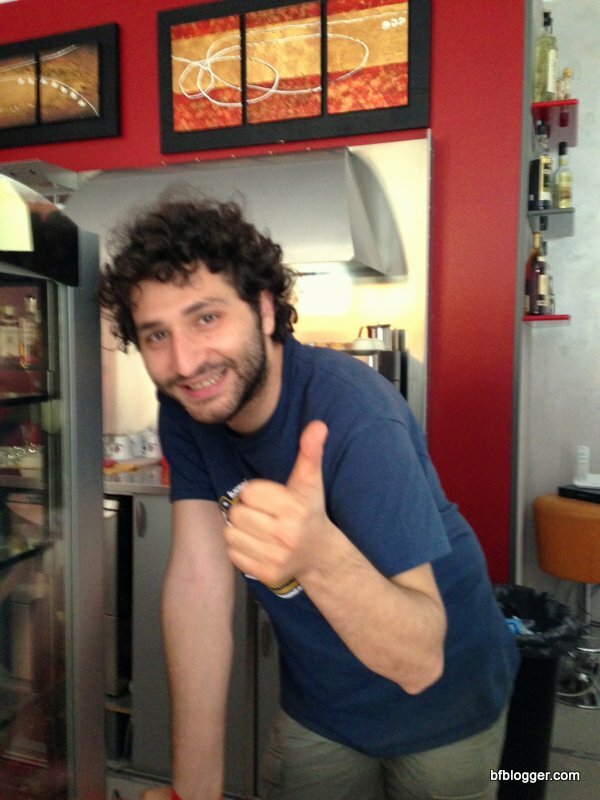 Food vendors and cafes were open for business… and happy to see us . One stop for tea and coffee ended up in a karaoke! The proprietor thought I looked like Petula Clark. We all started singing “Downtown”! What fun! I was really looking forward to a bowl of bouillabaisse. Who can go to Marseille without tasting it? You need to book reservations two days in advance for some restaurants to prepare this Marseille favorite for you. Be sure to plan ahead. We chose to try the bouillabaisse at Grand Bar des Goudes in Le Goudes, a village outside Marseille. The tiny town is in a district of Marseille on the way to the Calanques. Little did we know that it would take a couple of hours to drive to Le Goudes on a Sunday. It didn’t help that throngs of people in cars, on bikes and on foot were heading that way after three days cooped up in the rain. Yes, we were late for our reservations, but the drive along the winding road and the views of Marseille were worth the hassle. The view of the fishing harbor from the restaurant in Goudes was pretty special too. Back to the main attraction — the bouillabaisse. Bouillabaisse is a provençal fish stew traditionally created by the fishermen of Marseilles. It was concocted as a way to use up the bony rockfish they’d caught along the Calanques that they couldn’t sell. Not all bouillabaisse is created equal. The variety I sampled was missing some of the shellfish. I’m taking the fact that there may be the “perfect” bouillabaisse waiting for me. A good enough reason to return to Marseille, don’t you agree? Did you know there’s a proper way to serve and eat bouillabaisse? Have you been to Marseille? Do you have a favorite restaurant? Where’s the best place for the bouillabaisse? Please let me know. I will return! Marseilles: A Stormy Past. A Brilliant Future. Travel enriches us. Sometimes it literally changes our lives. This is a travel guide to France and to some of the towns, villages and regions the Barefoot Blogger has visited, along with stories on each. Check back often as places will be added as quickly as I can pack my suitcase! Bookmark the page for future reference and pass it along to your friends if you’d like. How Can One Fine Day Go So Terribly Wrong? Move in 7 Days or Bust! Heading for a Beach in France? Nice! Jeudi de Nîmes: J’aime Nîmes! The Feria’s in Nimes. Let the Party Begin! Pont du Gard: Architecture or Art? A Dream Vacation in the South of France. It’s All in a Day’s Work. Sete or Marseille? Which Has the Best Fish Soup? 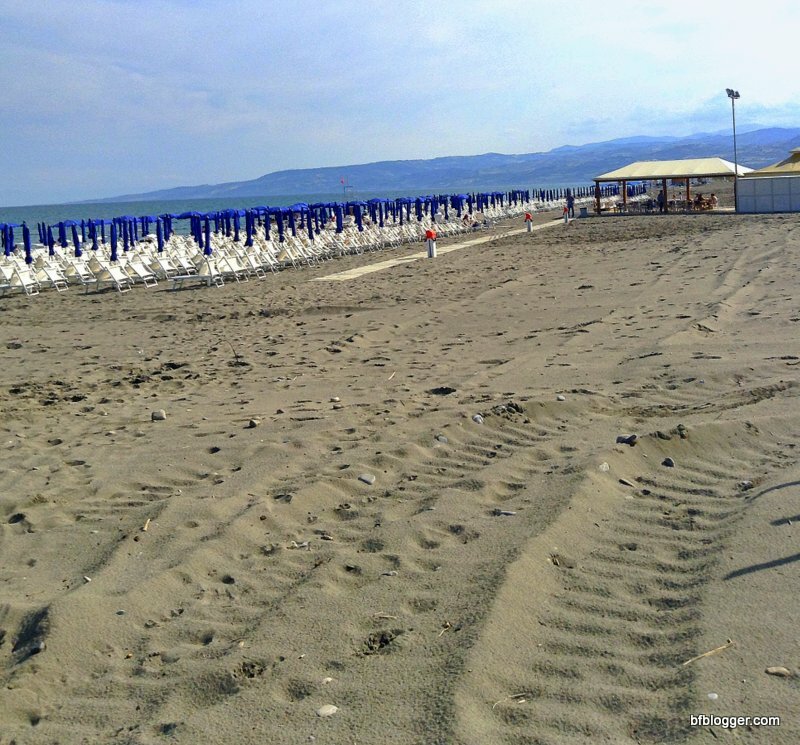 A Day at the Beach in Sete: That’s Life!